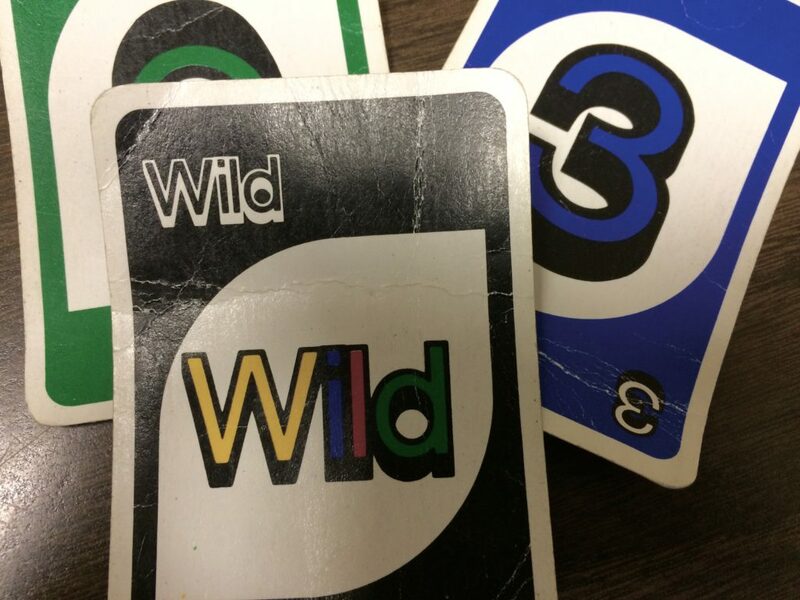 This is a great go-to game for big classes! I like it because it keeps all the kids involved in the game and moves quickly. It’s a good way to practice throwing and kicking skills as well. The offensive team starts with four players up at “bat”. One player kicks a rolled kickball, next throws or punts a football, 3rd player throws a frisbee, and fourth throws the reaction ball. This should happen quickly, one right after the other. Once a player has thrown/kicked his or her tossable he begins running bases. Do not stop running. Each time a player passes home plate, a point is scored. The 4 players continue running until all 4 tossables are returned to the container (kept at the pitcher’s mound). At that point, 4 new players come up and repeat. There are no outs. The offensive team plays until each player has had a turn to throw/kick. Defensive team cannot walk once they have a tossable in their hand. They must use teamwork to throw and catch and get all items back in the bucket. One player will serve as pitcher. The pitcher will roll the kickball, and serve as the final catcher placing the items in the bucket. Players yell “stop” once all items are in the bucket. Then offensive players stop running and scoring stops. Once all of the offensive players have had a turn at bat, the teams switch places. I love this game because once the kids know the rules, it is easy to start and stop. Watch time and make sure both teams get equal team as offensive team! This game works well for field day! Divide class into 2 equal teams. Assign each team member a number, stressing that it is important for them to remember their number. Teams stand against the wall on opposite sides of the gym with scooters turned upside down in front of them. Each team will have an equal number of scooters. (For my classes of about 28, I used 8 scooters total, 4 per team). The teacher randomly calls out 4 numbers (match number of scooters) and rolls the yoga ball out into the middle. 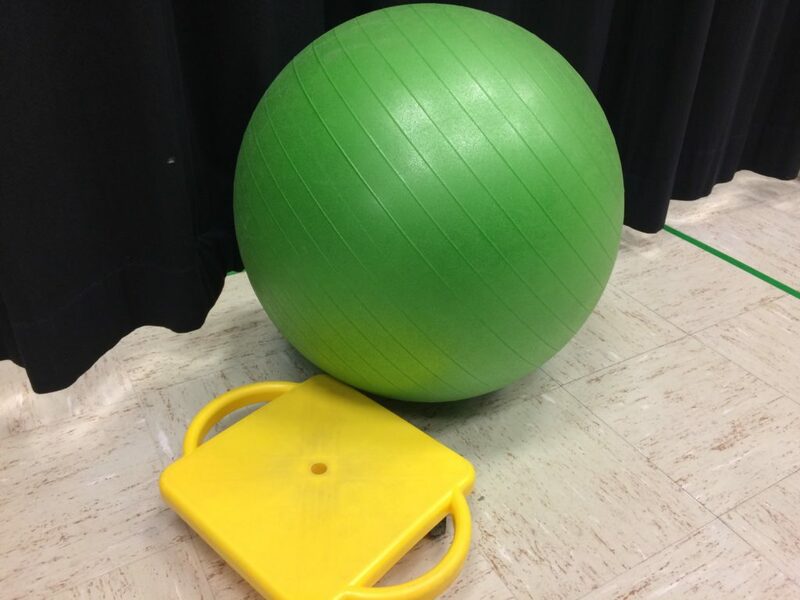 The students who are assigned those numbers, run out grab a scooter and try to get the yoga ball to hit the wall on the opposite end of the gym. When the ball hits the wall, that team scores a point, everyone lines back up, scooters are back upside down and 4 new numbers are called. I played this game with 3rd thru 6th grades. They had a blast playing! It was fast-paced and easy with almost no set-up. It does take some careful explanations the first time through. With 8 players on the floor at a time everyone was actively involved and the rounds went fast so no one was waiting long. My kids came back begging to play it again the next week (especially 6th grade). A goal I have for my PE students is that they develop a positive attitude towards exercise. I ask my students at the beginning of the year how exercise makes them feel. I repeat that question several times a year looking for a change in attitude. At the beginning, I get a lot of answers like “tired” or “sore”. With some guidance, my students move towards answers like “awesome” and “happy”. Here is lesson idea to help young students develop a positive attitude towards exercise and also learn a little about the body. I start by asking my class what happens to their body when they exercise. How do they feel immediately afterwards? I get a wide range of answers and I use certain answers to teach about the benefits of exercise. For example, if a student answers that exercise makes their heart beat faster; I can talk about how good exercise is for their heart and how it needs opportunities to beat fast to get stronger. After a brief discussion time, I play aerobic games that my students really like such as Noodle Ninja and Spider & Flies . After each game, I ask the same question. What do you notice is happening to your body? We add to previous answers and I usually get more specifics such as “I’m hot” or “I’m breathing hard”. I add that the game we played was a fun way to get exercise. Continuing with ideas and small discussions mixed with physical movement through the year helps my students learn that not only are there lots of ways to get exercise, but that it is fun and makes them feel good. Halloween is just around the corner and we like to celebrate a bit in PE. My younger classes absolutely love this scooter game we call “ghosts in the graveyard”. They are already asking if we will be playing it for Halloween this year! Divide your class into small teams of 4-6 players. Teams should line up on one side of the play area. On the opposite side, scatter the round cones. This is your “graveyard”. Hide ghosts randomly under the cones or “tombstones”. On signal (music starting), one person from each team will ride the scooter down and check under ONE cone. If they find a ghost they bring it back with them. Otherwise, they just scooter back. Hand the scooter to the next person and repeat. I play the length of one song or you can count ghosts as they are found and quit when they have all been collected. 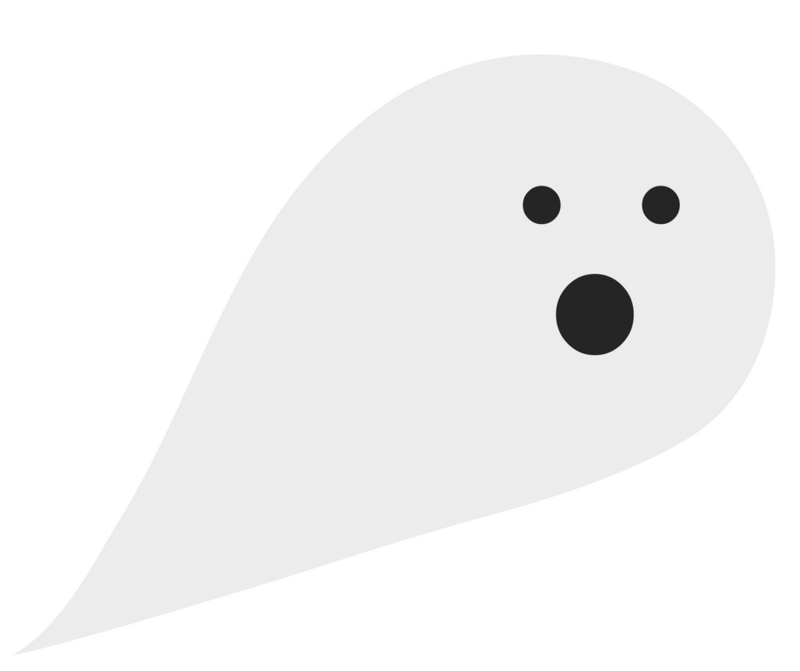 Count up the ghosts, then have a few students help hide them again. After they have been hidden, I have all my students close their eyes while I mix things up so no one knows where they are. Repeat and repeat. You could keep score but I just let them count and declare a winner each round. Have a fun and active Halloween! 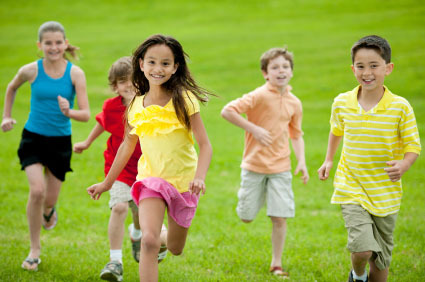 Motivate families to move with a FUN RUN! * Remember that it doesn’t need to be a huge event. Keep it simple! *Put a committee together. Most people don’t mind helping if they just have a small chunk of the job to do. Break things into smaller pieces and delegate. Use the list below and give each committee member one assignment. Choose a date. You can’t please everyone. Remember your purpose. Fall runs are great to kick off a year of activity. 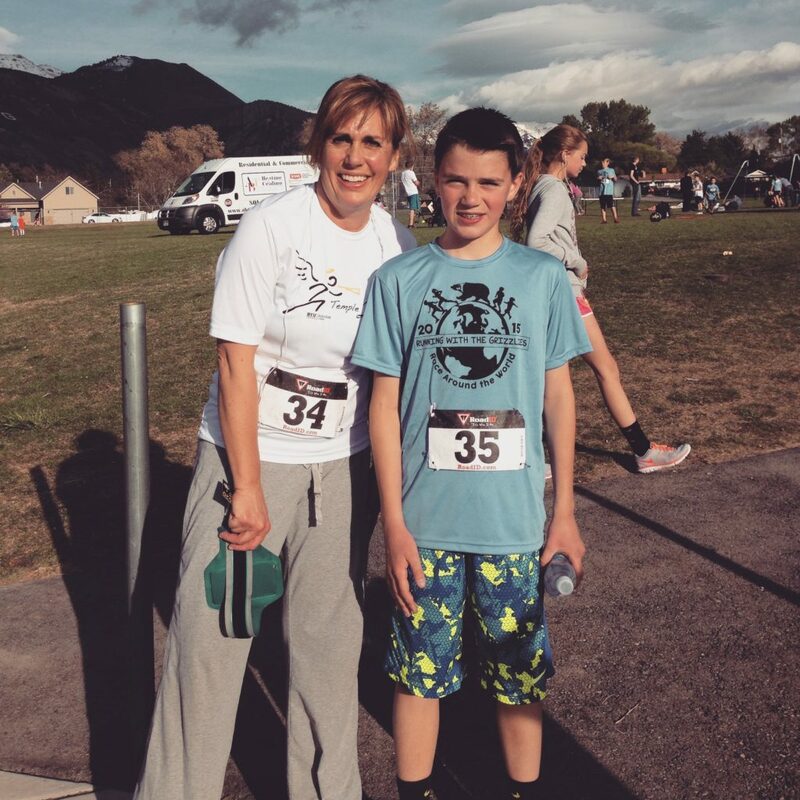 Spring runs can give your students a goal to work for. Design your route. For a fun run, you do not need a certain distance (like a 5K). Find a route that works and is safe for your area. Avoid busy streets and too many confusing turns. For an elementary run it is a good idea to have a short cut route for younger students and a longer, connected route for the older ones. Check at your local city offices for regulations regarding events like this. You will probably need approval. Advertise! Flyers, pump up the kids at an assembly, posters around town, etc. Make sure your whole school community is aware of your exciting event. Volunteers. Beyond your planning committee you will need volunteers the day of the event. Passing out any registration materials (if used), manning street corners and crossings, water and snack stations, and the finish line are places that volunteers can be used. Having some cheerleaders along the route is also great (teachers with noise makers!) Enlist the help of other teachers at your school, parents, and even older siblings. Water and snack stations. Snacks are optional for a short run and do add expense. You will want to plan one water station midway and one at the end for runners. If your route has any challenging sections, you may want a boost for that area. For example, you could give out a couple of pretzels at the top of a hill. Prizes. Again, this is not necessary, but kids do love prizes. Keep your run non-competitive for families by giving a prize to everyone who crosses the finish line. Our school uses licorice ropes with a gold chocolate coin glued on like a medal. Timing. Don’t worry about official timing or individual times. Post a big timing clock and interested kids can see their time as they finish. Simple! Registration. This can also be eliminated to simplify. If you want to charge a registration fee, I recommend charging a flat family rate to encourage all to participate. Fee can include a racing number, coupon donations from local businesses, t-shirt or water bottle, etc. Make it an event. Also optional, but it is motivating to have fun things for families to do as they finish the run. Food trucks, a local band, game areas, stretching station with a local mascot, anything that makes finishing the race a party! Don’t forget to practice for the fun run by doing some running in PE class. This can be a great motivator. Getting families moving together can be life changing for kids! Posted in 1-2nd Grade, 3rd - 4th grade, 5th-6th Grade, Latest Post	| Comments Off on Motivate families to move with a FUN RUN! Hopscotch and Making Recess Better! 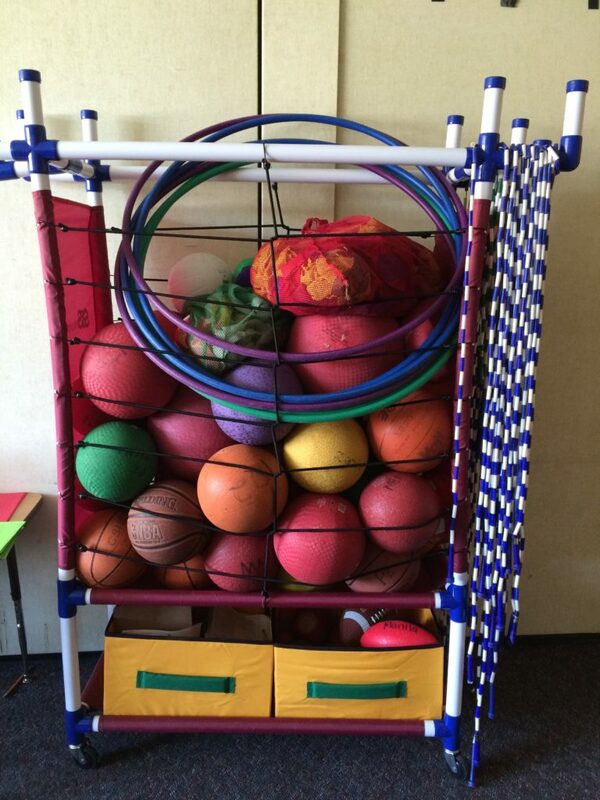 First, I put together this awesome recess cart! The school paid for the cart, and I had enough excess equipment to stock it. I presented it to all my classes during the first week of school and talked about care and expectations with the equipment. Now it is watched over by an aide at recess and students can check out any equipment. I told my students it is like a “recess library”. Next, after any activity we do at PE, I try and point out to them that this is something they could do at recess if they enjoyed it. I want to expand their thinking on ways to be active. Even if you don’t want to join in the soccer game, you can still be moving. And, this week I have been teaching old-fashioned classic games that seem to have died off a bit. I taught them 4 square. This one is always popular, I just needed to clarify basic rules. Then, I taught tetherball. Our tether balls had been removed because the kids were sitting on them and snapped all the ropes. Our custodian fixed them for me and I am trying to teach the kids how to play the game properly. They are very excited about the tether balls joining the recess cart soon. Hoppy taws are also available for purchase on the hoppy taws site. Give it a try! I bet your students will love these classic games too! My youngest classes love dancing and moving to music. I use music on a daily basis to add energy and enthusiasm. Here is a fun and easy game that is great for a quick warm-up, time filler, or even a small space activity. Pass each student a card and have them move into their own space. When the music starts they do the movement assigned to their card color. When the music stops, they freeze. I then call out “trade” and they trade cards for a new color. Repeat. I used this during the first week of school to practice freezing on signal. I made sure they were quiet and looking at me before we traded again. This made it a fun way to practice my rule of freezing when the music stops. My 1st and 2nd graders loved it! 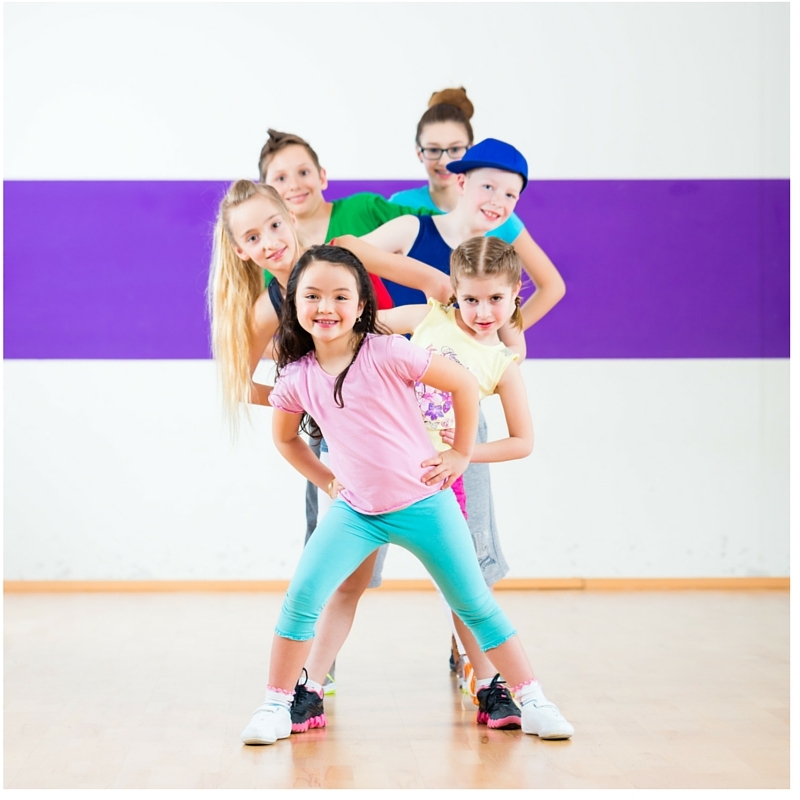 I usually lead my 1st – 4th grades in a warm-up routine. This week I wanted to see what my 3rd and 4th graders had learned; so I gave them more independence allowing me to observe and assess. Make a big circle with each small group. Decide who will go first. That person demonstrates a stretch or muscle movement that can be done in place. Everyone joins in on the stretch and the group members count out loud slowly to 15. Move around the circle giving everyone a turn to be the leader. Be thinking about what your stretch will be so no time is wasted. No repeats allowed. When you are finished, send a representative from your group to me for your next instruction. I gave them a sequence of 3 cardio activities to finish up. This gave me an opportunity to watch and see what stretches they used and even circle around and ask what muscle they were stretching. Great for assessment and the students enjoyed the independence. I had zero discipline issues and they worked hard. I have some fitness testing coming up for my 5th and 6th grade classes. I wanted to do something today to give them a good workout and help them prepare. This lesson turned out great! I have my classes divided into 4 groups of 7-8 students. (read about my method here). 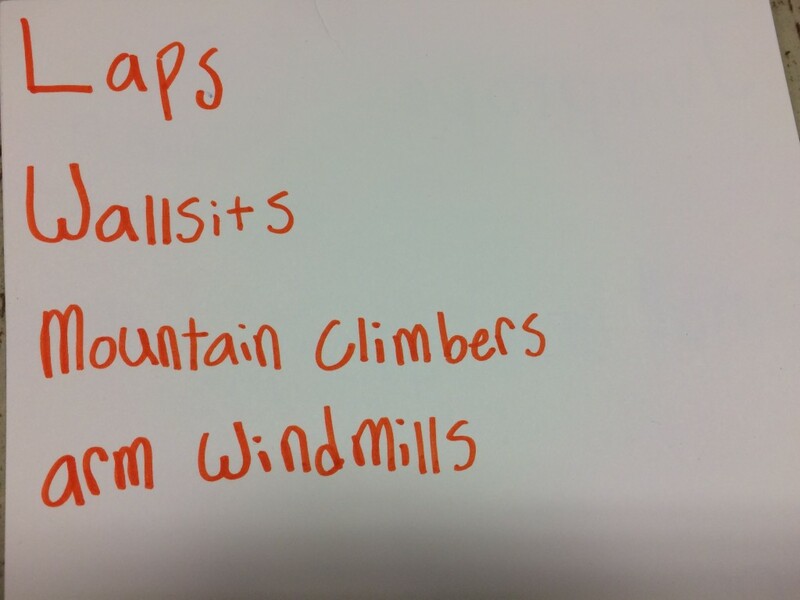 I had the students sit in their groups and assigned them each to write a fitness circuit. Their circuit was to have 2 cardio and 2 strength activities. We talked about what the word cardio means and some examples of both kinds of activities. The circuit was to rotate in a cardio-strength-cardio-strength sequence. They did not have to assign a number of reps because we would be timing the rotations for 1 minute. I also told them that if they wanted equipment for their exercises I would get it out for them (jump ropes, yoga balls, etc). I gave them half sheets of cardstock, a marker, and a cone to attach it to when done. The kids loved writing their own circuits! They were so proud of them and worked harder. And they really did work super hard! I’m not sure if it was the ownership that did it, but even my hardest to motivate put in a full effort. Using a timer instead of a set number of reps allowed students to work at their own level and pace. Easy! I didn’t have to spend hours writing up exercises, cutting, laminating, etc. Good for promoting teamwork. I put the “warm-up captain” in charge and they love having a job to do. As my students left class, they were commenting on how much fun it was and asking if we could do it again. I love it when fitness turns fun! I try to plan all my PE lessons so that my students are moving a lot and getting aerobic exercise while having fun. Every once in a while, especially as they get older, I like to teach more pointedly about aerobic health. I tried this lesson today with my 3rd and 4th grade and it went great! Start with a warm-up that gives a lot of aerobic activity. I used this game which my kids love. I followed the warm-up by having the kids sit down and telling them that today we were going to do an aerobic challenge. We talked about the word “aerobic” and what it means. They knew that it meant some kind of exercise, but not that it was referring to exercise of the heart and lungs. We had a good mini discussion. Then I gave them all a written aerobic challenge of about 10 activities. Instructions were to work on their own, to do the activities in a random order (to help space them out and share equipment), do exercises correctly, and to move clockwise for anything that asked them to move around the perimeter of the gym. I handed out the papers and let them work. They worked really hard and had a great time. I instructed them to pay attention to their heart and lungs working as well. For fast finishers: For fourth grade and up I gave them a piece of scratch paper and pencil. They were told to write down their own exercise routine of 5 exercises that they could do at home. I challenged them to do their routine every night. If they had time, they could do their routine now. For my third graders, I let them have free time with any equipment we had out (my fastest finishers had about 5 minutes of time left). My students really dived into these activities and we had a fun and productive class. Hopefully it will help them remember the meaning of the word “aerobic”.